My popular 3D LUT pack includes 4 3D LUTs emulating the ARRI Alexa color but moreso features varying degrees of color enhancement meant to not only pretty up skin tones, but kill and remove magenta hues that some experience when grading slog3/sgamut3.cine footage and use LC709A as a base. This LUT pack has been used on everything from network produced TV shows and documentaries, to corporate interviews, and more! Now as part of a BLACK WEEKEND SPECIAL you can download the full version and try it FREE. This OFFER has now EXPIRED – to purchase the 3D LUT pack please visit here. 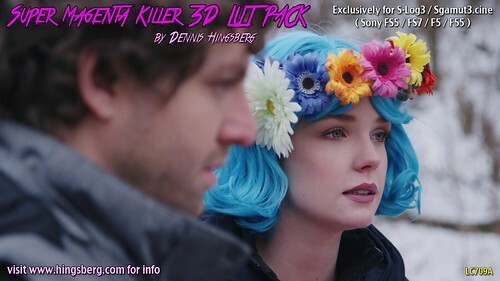 For those who are tired of dealing with a dreaded magenta cast in their Sony footage I have developed an amazing 3D LUT pack that I’ve decided to share and call the Super Magenta Killer 3D LUT pack! Aside from reducing a magenta cast in your footage, these 3D LUTs also emulate the ARRI Alexa/Amira REC709 color profile so you get a look much closer to the popular camera’s by ARRI. The 3D LUT pack comes with two 3D LUTs called Super Magenta Killer Base, and Super Magenta Killer Base plus Skin Boost. As a bonus I’ve also included two extra 3D LUTs which you can use for real stubborn magenta hue’s present in your image. The 3D LUT pack can only be used on any Sony camera that shoot slog3 gamma with sgamut3.cine color. Below are some samples using the Super Magenta Killer 3D LUT pack but also have a look at some high resolution frame grabs in my Flickr photo album. I plan to add more sample images of my own and collected from others very soon!